As well as trying to accomplish the family’s dream design kitchen and dining room, I persuaded the boys (ok, ok, bullied, cajoled and begged!) 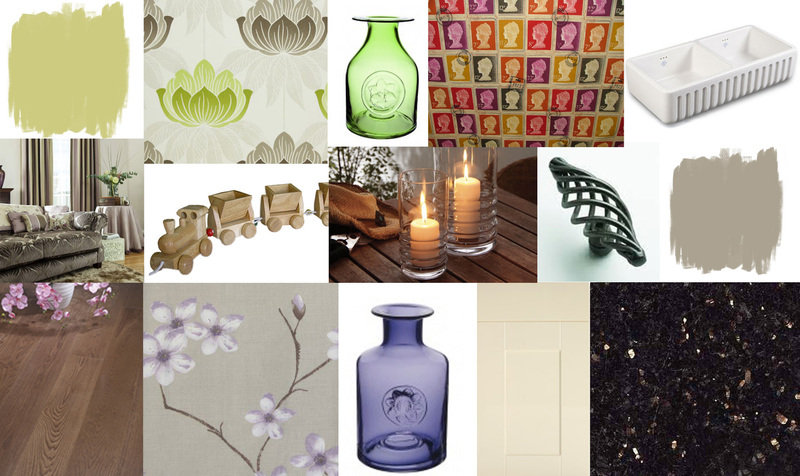 that we should also plaster, decorate and floor the living room, thus ensuring a rod for my own back as we would then need furniture & fabric to make it look fabulous for our reveal – DOH! This would be a problem as we had NO money left. I had to promise PM Nick to wangle everything for free or for the absolute rock bottom price. 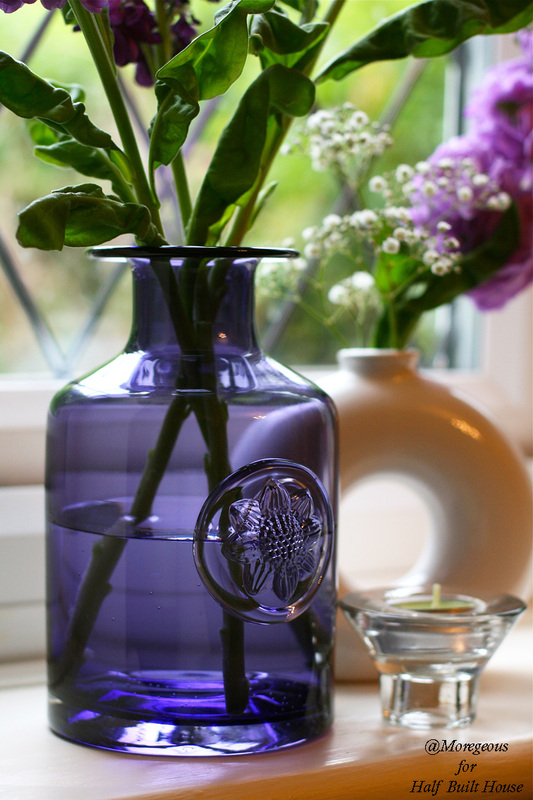 I chose an accent colour of purple for the front room and played with different muted tones to keep the look elegant and sophisticated. Once we’d fitted the new picture rail, the newly skimmed walls were painted in Dulux Pale Walnut, a taupe shade with a gentle lavender hue in certain light, fitting in perfectly with the French theme and my half finished (!) mood board. 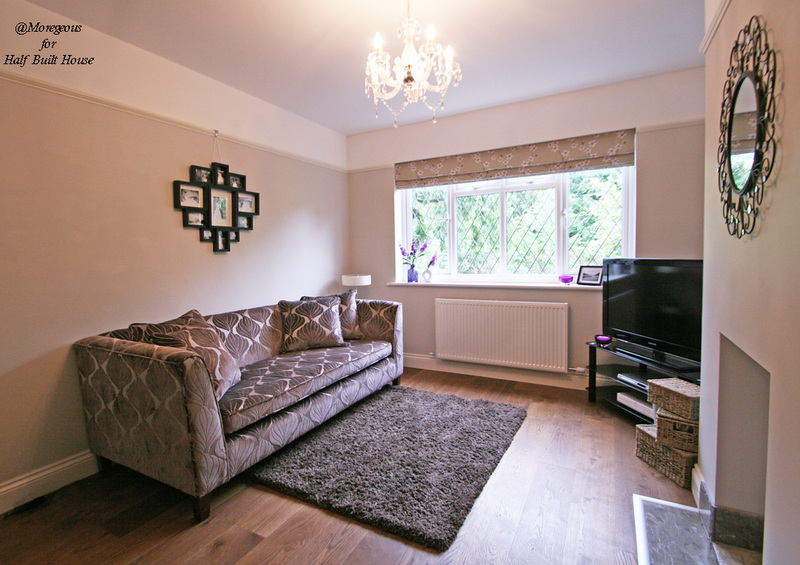 The warm tones of the harvest oak flooring ensured practicality and a more ‘country’ feel than contemporary timbers, Chris & Kyle from Clic-It Flooring did a great job of the fit. 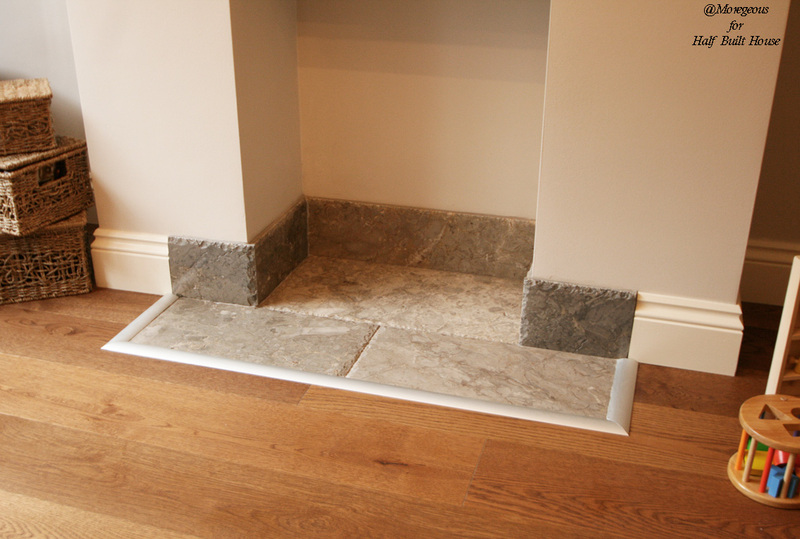 Dominic tiled beautifully in the fireplace with the Java Grey marble tiles and we used tiling instead of wooden skirting around this area as it had been mentioned that there may be a wood burning stove fitted in the future. 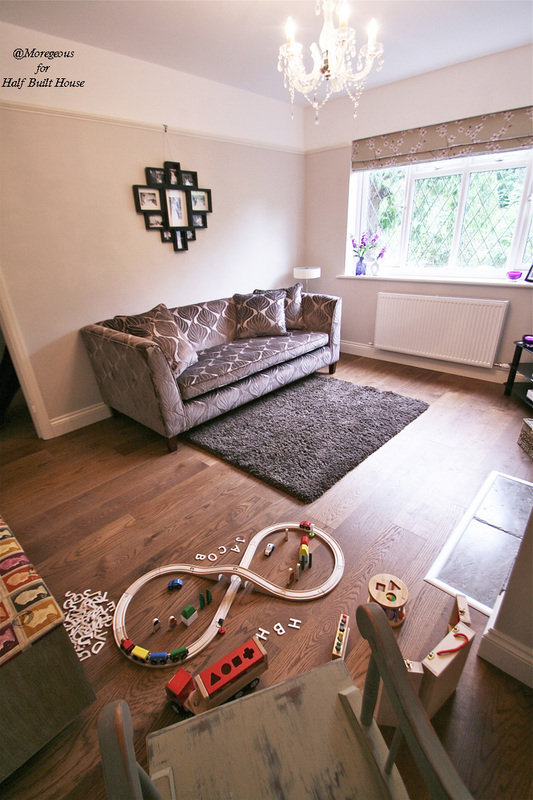 I really wanted to provide this young family with a fantastic sofa they could all relax on but couldn’t find one large enough or luxury enough. Luckily Glyn Smallwood & Prestigious Textiles came to the rescue. Glyn is an expert upholsterer who also makes his own furniture, or that of his client’s design at a very reasonable cost. 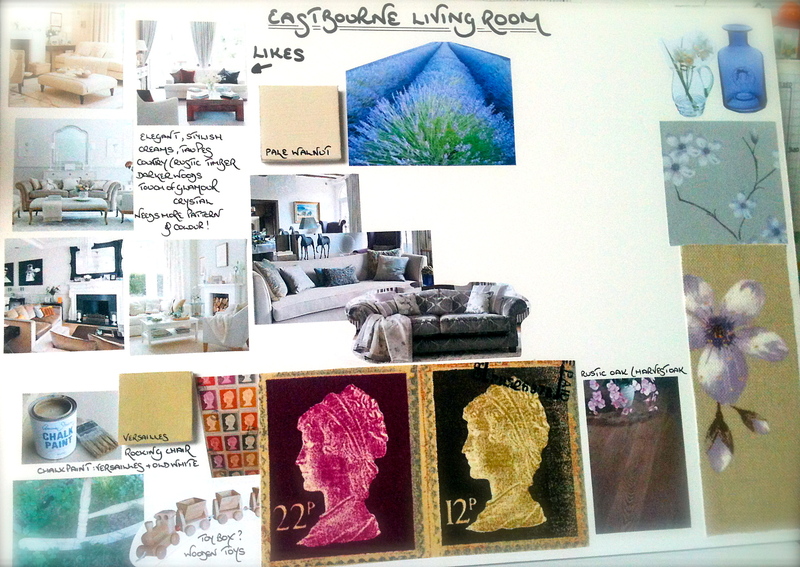 I chose a gorgeous and hard wearing sofa fabric from Pretigious’s Élysée range, sent Glyn an image of the sofa style I wanted, he made the sofa, then covered it with our fabric. 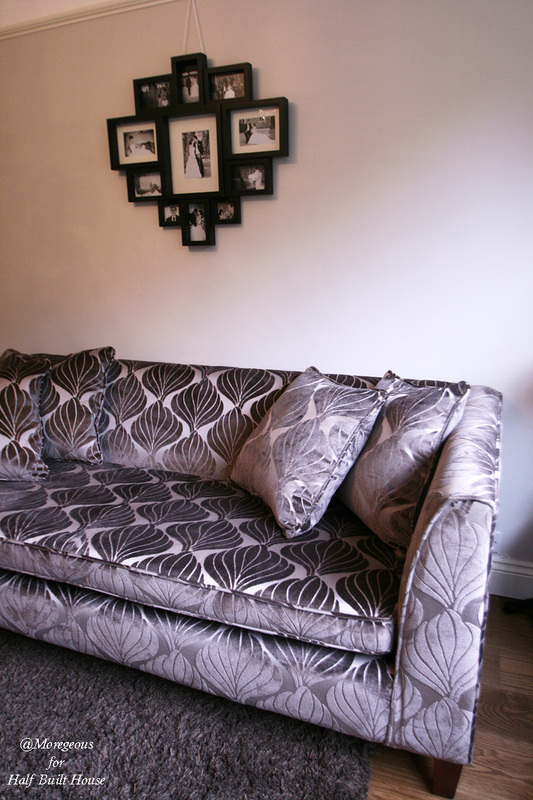 Costs vary according to what fabric you choose and the size of the sofa but how fabulous to have a complete one-off in your home – Made In Britain – brilliant! 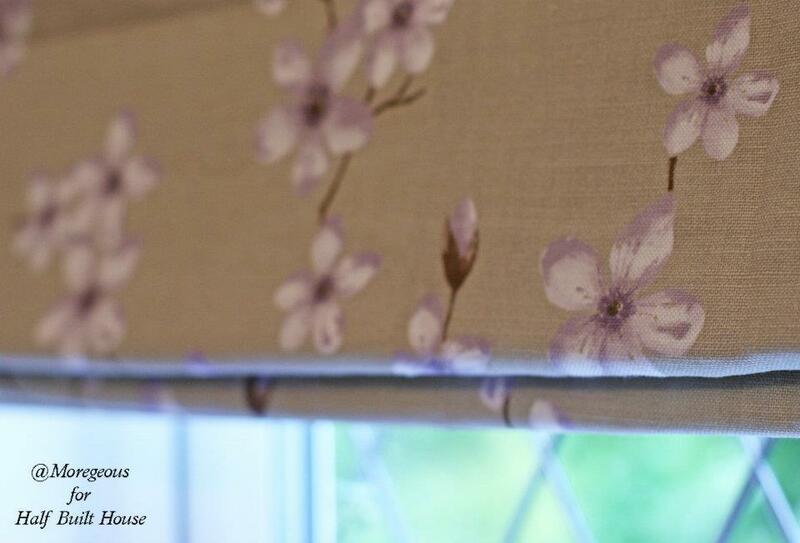 The small violet flowers on this Lorient Blossom fabric were ideal for the room and Kay from Curtains Made For Free had them made for us in no time. All that was left to do was clean down & dress the room (which caused a bit of stress at the time & gave rise to yet another Mr M one liner “Apart from that, are you happy?”).